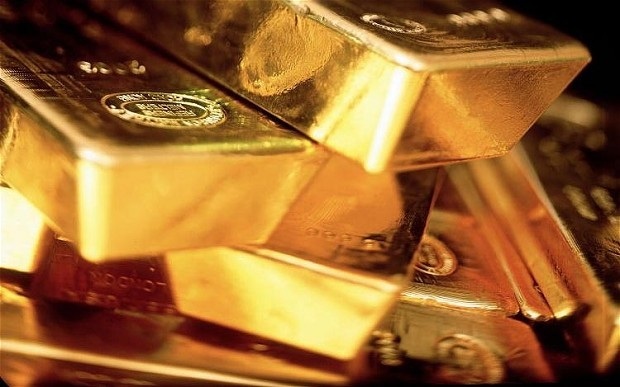 The Deutsche Bank analysis warns that gold needs to fall further by 30% to reach $750 an ounce in order to bring prices back towards long-running historical averages. The bank analysis factors in world growth, the U.S. dollar, money supply, and central bank gold purchases with fair value calculated at $785 an ounce. Gold is clearly starting to build that force we have warned is required to make the major low. Then there is the extreme forecast of $350 published by Market Watch: Two reasons why gold may plunge to $350 an ounce. Gold must lose all its friends, and the gold promoters must be fully discredited. This is how markets top and bottom no matter what market we are talking about. Of course, the hate mail is coming in, asking if I am satisfied. My answer: when are you going to use your brain instead of acting like a brainwashed pawn, no different from the recruits of ISIS? The gold promoters have hurt a lot of people and ruined their financial futures, yet people blame me because they made a stupid “investment” based upon propaganda. The gold promoters may even see class action lawsuits filed against them for masquerading fake analysis as real analysis. You cannot have a conflict of interest and be an objective observer, no less an analyst, at the same time. After all, when the major investment banks put out such nonsense as fake analysis, they were charged with fraud and paid huge fines for the same sort of nonsense they called analysis during the DOT.COM bubble. There is no difference. You CANNOT be an analyst and sell gold at the same time, or be on the payroll of those who sell gold, or the bankers who were manipulating markets for short-term gains. You have to shake the tree before a reversal in trend ever takes place, regardless of the market. The majority of the sentiment must swing against gold, for in the end that will be the fuel that reverses the trend – short covering, not fresh buying. The low will be a question of TIME and PRICE, and when that combination is achieved, then and only then will the market reverse. Instead of blaming me, try learning something about how markets functions if you want to play the game. If you are not capable of digesting anything but propaganda, well keep buying until to cannot even feed the dog. There are still the gold promoters who claim they can prove that paper gold suppresses the gold price. If that were true, it would apply to all futures, and besides that fact, they have no problem when gold rallies in the futures market. If their theory were correct, then why buy gold? Give up and buy stocks. “Paper gold” is the ONLY reason that gold is a viable market. Without a central clearing house, any commodity becomes illiquid. How do you price it? It becomes an art. Its value becomes a matter of opinion. 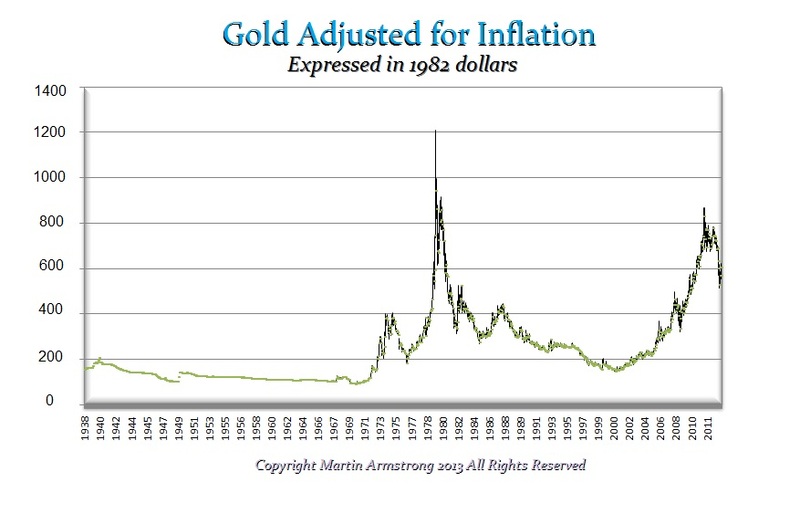 You only ever hear how “paper gold” suppresses the gold price in a bear market. During bull markets, they love the futures markets. Could it be that these people are just hopelessly biased and desperate to try to explain why they are in a losing trade? Others cry that rising demand caused the U.S. mint to stop production to keep up with the demand, meaning gold is suppressed by paper gold elaborately resorting to supply-demand theories. What they totally ignore is that at the peak in markets, it is the demand for futures because the bulk of people “trade” and do not want to physically take possession of gold. They trade on leverage. These promoters totally ignore that the concentration of capital into a single sector that creates the Phase Transition or the flight of capital that creates the Waterfall. They come up with elaborate theories to explain why they are wrong when in fact they do not understand that EVERYTHING rises and falls in value. It is not even that people fall out of love with gold; it is the simple fact that they can make more money elsewhere. A $1,000 investment in gold in 1980 vs. a $1,000 investment in the Dow Jones Industrials shows that the latter made money and the former lost more than 50%, since adjusted for inflation gold must be $2300 to breakeven. Gold has not been in a real bull market, measured in international value terms. So all the hype, claims, and finger-pointing means absolutely nothing. This is not a religious cult like ISIS – it is a market. If you distrust the monetary system, fine. But be rational about the timing and how the world functions. So, sorry. I totally disagree with gold promoters. Gold will have its time to rally and futures will be a key element in helping to create the next bull market. Just utter nonsense with more excuses, one after the other. Why are all futures markets not suppressed? Under this theory, the U.S. share market must be worth 10 times its current value for it must be suppressed by paper futures and ETFs. Sunday, Sept. 13, 2015. The day when the elite (the Rothschilds, the Rockefellers, etc.) have scheduled a worldwide financial collapse to occur. They intend to accomplish this by initiating a sudden spike in interest rates, which will trigger an implosion in the global derivatives market, effectively rendering all currencies worthless – including the U.S. dollar. Subsequently, we will all awake on Monday, Sept. 14, 2015 to a permanently changed world. Just what would such families gain by destroying the world economy? Their wealth is measured in the same currencies. This is why gold is not ready for prime time because nobody in their right mind wants to be associated with this stuff. 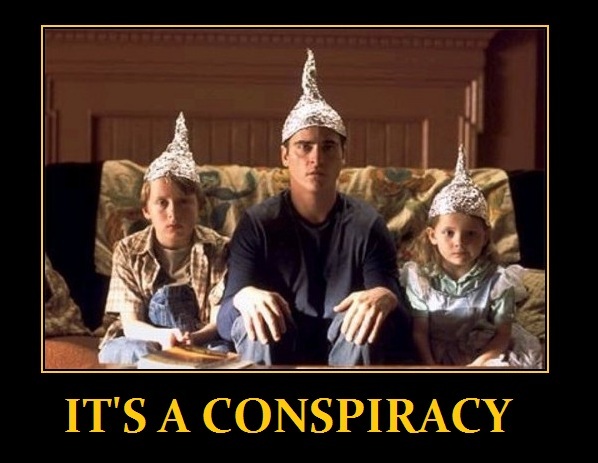 Where is your tinfoil hat? This total fraud has to stop. No market is a one-way street. We explained that the peak in gold completed a 13-year rally and a correction would then follow from 2011. We also provided the target that gold would crack the $1,000 level, and provided the timing for the low with the reversal in trend. That is called analysis. Nothing moves only in one direction. All markets rise, fall, and then rise again. 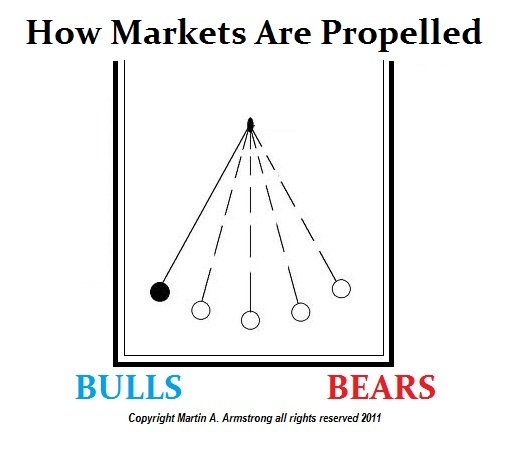 Open your eyes and learn market movement if you want to play the game. If you want to believe you are a victim of the bank manipulations, go right ahead. Then why invest in something that never rises unless you enjoy being the victim?